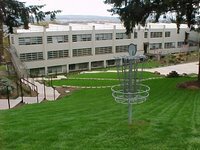 It is great to see that the disk golf course is still standing. The following picture is courtesy of Theodemos (at Bunch O'Blog Sr.). Dude have you been down there lately? That's the only one that's left after all the devastation that's been going on there. I don't even recognize that school anymore except for the sky bridge. I haven't been down to Salem since the day we left our apartment and moved up here. I need to go see the campus next time I am in Oregon.